Bruce Grobbelaar is a Liverpool icon. One of the most eccentric, flamboyant personalities of the English game in the 1980s, he picked up countless honours with his club both at home and in Europe, including that famous European Cup win in 1984 where his distracting “spaghetti legs” move helped the Reds to victory in a penalty shootout against Roma in their Olympic Stadium home. The sight of Grobbelaar, with his distinctive moustache and gangly, elastic frame, making superhuman saves was all too common, a key part of the club’s remarkable run of success until 1991, when they won their 18th and, to date, last league title. But for all the medals, one thing eluded Bruce. His relationship with international football, and his home country as a whole, was often fraught, and was ultimately a fruitless endeavour. He was born in Durban, South Africa in 1957, but moved with his family to what was then known as Rhodesia shortly after. After playing a small number of games at home and in Durban in the mid-1970s, he completed two years of national service in the Rhodesian Regiment, fighting for the government of Ian Smith against the revolutionary forces led by Robert Mugabe. In 1979, after attending a trial in South Africa, he earned his first major opportunity in football, signing for the Vancouver Whitecaps in the North American Soccer League. From there he had a loan spell with Crewe Alexandra in England, where he attracted the attention of Liverpool’s scouts. After a brief return to Vancouver, in which time he established himself as their number one goalkeeper, the Reds bought him in 1981 for £250,000. Initially a back-up, Ray Clemence’s shock departure to Tottenham not long after he joined allowed him to complete his rapid rise, becoming first-choice keeper for England’s top club just two years after signing for his first professional club outside southern Africa. But while such stardom should have guaranteed his place in his national team for more than a decade, things weren’t quite so simple. Mugabe had completed his own rise to power in 1980, with ZANU-PF winning the first elections in the nation now known as Zimbabwe. 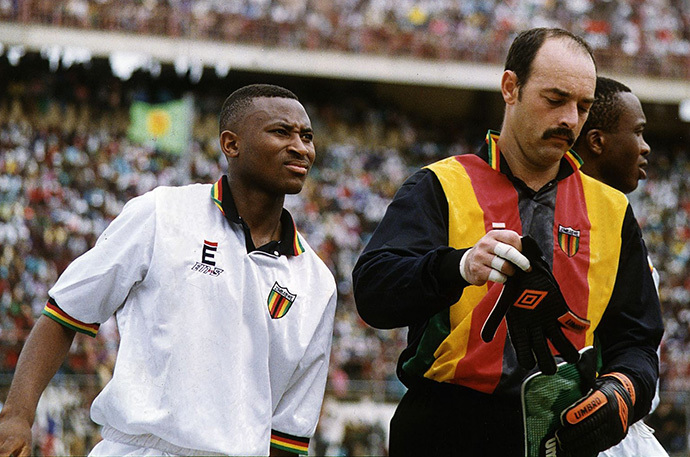 The history of Mugabe’s relationship with sport is long and complex, and Grobbelaar provides a case study. Though he competed in a handful of matches for the Warriors throughout the 1980s, he eventually found himself out in the cold. As a symbolic cutting of ties with their former colonialist superiors, Mugabe had brought in legislation forbidding dual Zimbabwean and British citizenship, of which Grobbelaar was a major beneficiary. With Liverpool’s success and the continuing struggles of the Zimbabwe national team, Bruce stayed away. It just wasn’t worth the hassle. That changed in 1992, for both Grobbelaar and Mugabe. On Merseyside, the goalkeeping situation had changed: the arrival of David James, a hot prospect signed from Watford, had left Bruce fighting for, and eventually losing his position. At nearly 35, time was against him. But instead of sitting on the bench, an intriguing offer came from home. The Zimbabwean government, recognising both the position Bruce was in at Anfield and the benefits a successful national football team could bring them politically at home, helped new head coach Reinhard Fabisch make a pitch to bring him back into the fold for qualification for the 1994 African Cup of Nations and the World Cup. Bruce, recognising this may be his last chance for international glory, accepted the offer. This was a particularly shrewd move by the Zimbabwean authorities, as the Warriors were a team on the rise. Though Zimbabwe had been represented at the Cricket and Rugby World Cups, in football they had never qualified for either the World Cup or the Cup of Nations. However, a new generation of players in the early 1990s was bringing them towards the top of African football for the first time. The gems of this cohort were the Ndlovu brothers, Adam and Peter. In 1992, Peter, aged 19, was a year into what would become a seven-year spell with Premiership club Coventry City. Adam, at 22, was a regular for Bulwayo’s Highlanders; he would later spend much of his career in Switzerland. Alongside them was striker Agent Sawu, another promising youngster at 21, who would also move to Switzerland in later years. This raw, pacy attack provided the impetus for the team to progress. As a top class goalkeeper, it was hoped Grobbelaar would provide the final piece of the puzzle, providing confidence, experience and leadership to the young squad. They became known as the Dream Team, after the all-star US Olympic basketball squad from the 1992 Olympics – as much as anything, this was because they were now chasing the dream of finally representing Zimbabwe at a major tournament. The prodigal son’s first match back in the national team in August 1992 carried enormous significance even before he arrived back in Africa: a politically-charged Cup of Nations qualifier against neighbours South Africa, still under white rule despite the end of apartheid, but now back in international football after their exclusion, and a major element of the forging of the new Rainbow Nation identity. Grobbelaar received clearance to play only a couple of days before the match, heightening the occasion, while Fabisch created a siege mentality in the media by emphasising the Warriors’ underdog status. They won 4-1. Peter Ndlovu later described one of the two goals he scored in the match as the greatest of his career. From here, the Dream Team began to pick up momentum, providing the national morale boost the government intended. While they had been drawn into a difficult first round group in World Cup qualifying, in the event it was only Egypt, qualifiers in 1990 and one of African football’s powerhouses, who could stop them. A sensational 2-1 win over the Pharaohs in Harare in December 1992, with goals from striking pair Peter Ndlovu and Sawu, set the scene for a dramatic group decider in Cairo in February 1993. Needing a draw, the Warriors tool the lead early in the game, but amidst a frenzied atmosphere, the experienced Egyptian players rallied. Hossam Hassan’s winning goal looked to have ended the Dream Team’s chances of qualifying. However, the atmosphere boiled over, with fans hurling objects onto the pitch. Fabisch and Grobbelaar were both struck. An appeal was launched. Feeling the need to make a stand against hooliganism, FIFA ordered the match to be replayed in neutral territory at the Stade Gerland in Lyon in April. An inspired Grobbelaar put in the finest performance of his international career, making save after save to deny the Egyptians. It finished 0-0, and Zimbabwe progressed to the final round of qualifying. With just one spot from each group to make it to the USA, the odds were still firmly against the Warriors, especially after being drawn against Cameroon, who had starred in the finals in 1990. The third member of the trio was another of Africa’s underdog nations: Guinea, led by the talents of future Liverpool striker Titi Camara, who had been fortunate to progress from a group with just two teams after the withdrawal of Mali and Gambia. At the same time, Cup of Nations qualifying was reaching a nervy climax, as a late equaliser in Johannesburg in April, nine days after the draw with Egypt, maintained Zimbabwe’s unbeaten record. The battle for their group’s only qualifying spot with another neighbouring country, tragedy-hit Zambia, would go down to the wire, with only a point separating them. Their World Cup qualifying group was destined to be equally hard-fought and tense. Just two-and-a-half weeks after their reprieve in Cairo, Zimbabwe opened their next World Cup group in Conakry. The result was nothing short of a catastrophe: a 3-0 defeat to Guinea left them on the back foot at the very start of the group. As they entered July, they knew this would be the crucial month for their aspirations for both competitions, as they first needed a positive result at home to Cameroon in the World Cup group, and then defeat Mauritius and Zambia to qualify for the Cup of Nations. In Harare, a tight match was resolved with four minutes to play, when Sawu scored the only goal of the game to give the Warriors another monumental win. They followed this with a 2-0 win over Mauritius, Sawu again on the scoresheet, leaving just the final match against Zambia. The newly-christened Chipolopolo were playing only their third competitive match after the plane crash that claimed 18 players and the coaching staff, but they had won both of their matches since the disaster with their hastily-assembled new team. But the intimidating Harare crowd had made the Zimbabwean capital a very difficult place for visiting teams. After Bristol City defender Henry McKop gave the Warriors the lead, it looked as if the Zambian fairytale was doomed. However, with 10 minutes to go, their inspirational captain Kalusha Bwalya rose to the challenge, heading an emotional equaliser to take his country into the Cup of Nations just weeks after the disaster in Libreville. But if one fairytale continued, another was crushed: Zimbabwe had missed their biggest opportunity yet to qualify for their first Cup of Nations. Nonetheless, the World Cup remained in their sights. Both they and Cameroon now had to face Guinea again before the final showdown in Yaoundé. Cameroon stepped up first in July, and a goal from David Embé was enough to give them a 1-0 win in Conakry, putting them ahead in the group standings. Zimbabwe welcomed Guinea to Harare in September, and Sawu was again the hero, scoring an early goal in another 1-0 win. The points were tied going into the last game, but Cameroon held the advantage in goal difference. Only a win would now do for the Warriors. 85,000 fans packed into the Stade Ahmadou Ahidjo to see their beloved Indomitable Lions attempt to qualify for their third World Cup in four tournaments. For Zimbabwe, the Dream Team still held a slim hope; not only did a first major tournament beckon, but the biggest of them all. But there was no room for sentiment in the partisan crowd, as Cameroon’s ambitions were ultimately much greater. After reaching the quarter-finals in 1990, this was not a team that would simply be happy just to qualify; they were bidding to become a force in world football, rather than just African football. At the centre of this was Grobbelaar, Africa’s best goalkeeper, who knew this would be his best and likely only realistic chance of representing his country at the World Cup finals. 13 minutes in, it all began to unravel. An extremely harsh penalty decision, given for an alleged handball, gave Francois Omam-Biyik the chance to score from the spot. Grobbelaar leaped to his right and parried away the shot, but Omam-Biyik pounced to poke in the rebound. 14 minutes later, a long punt forward was launched onwards by some head tennis from the Cameroon attackers, and Omam-Biyik brought the ball down, sent Grobbelaar sprawling with a dummy, and fired in. With just over a quarter of the game gone, all seemed hopeless for Zimbabwe. When Adam Ndlovu silenced the crowd with a goal just after half time, thanks to some awful positioning by Joseph-Antoine Bell in goal, a chink of light reappeared. But as the atmosphere became yet more intense, the tensions bubbled to the surface. Fabisch lost his temper, throwing US dollar bills at the officials in protest at their display, and was escorted away by police in helmets. In the end, a fine third goal from Emmanuel Maboang with a minute of normal time to play sparked delirium in the crowd. The Dream Team had turned into a nightmare. Just a few months before, it looked as if they would at least qualify for their first Cup of Nations, with the World Cup as a potential bonus; qualifying for both was not out of the question. In the end, they were left with nothing. In the circumstances, it was particularly galling. For Grobbelaar, there was to be no glory on the international stage. Having lost two opportunities to play in a major tournament for his country within the space of three months, he played on for the Warriors for another five years, often as player-manager. However, his career slowly slid away: from Liverpool to Southampton in 1994; accusations of match-fixing which led to an acrimonious three-year court case; a slide down the divisions, from Plymouth in 1996 to Northwich Victoria in 1999, via several brief stints with a series of lower league clubs; another souring of relations with the Zimbabwean authorities and more time in exile; and eventual bankruptcy. He chose to commit himself to coaching, and remains a popular figure at home and abroad, but his CV will forever have a gap for international football. Zimbabwe continued to struggle for another decade until they finally qualified for their first African Cup of Nations, the 2004 tournament in Tunisia. There they were led by the experienced Peter and Adam Ndlovu, and Agent Sawu, all survivors from the 1994 campaigns. While they failed to progress to the knockout stages, they did return two years later, with Peter, dubbed “Captain Fantastic”, now supported by the country’s new star, Benjani Mwaruwari. In December 2012, Peter and Adam were involved in a serious car accident near Victoria Falls, after a tyre blew on their car. Peter was seriously injured, but Adam tragically died in hospital, at the age of 42. He didn’t live to see Zimbabwe return to the Cup of Nations finals in 2017, a remarkable success story after a decade of turmoil, underachievement and government interference. While the industrious new Warriors again failed to progress from their group, their 2-2 draw with fancied Algeria was one of the tournament’s highlights. But while the country is now moving on from the Mugabe era with a promising team, the fondest memories remain for the Dream Team, the players that nearly put Zimbabwe on the biggest stage in football.